Much like SEGA (TYO:6460), which we covered yesterday, Square Enix (TYO:9684) is also having a poor year. 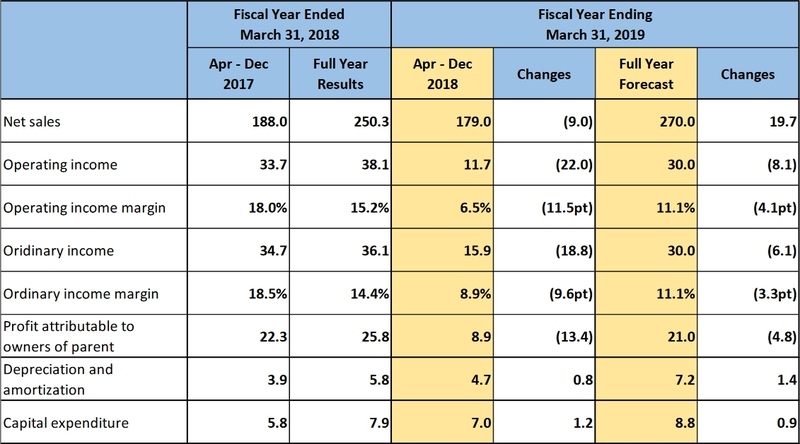 In their recent consolidated financial results and reference materials, Square Enix is showing continuing poor results that run in line with their first quarter and first half from the current financial year. In the nine months ending December 31st Square Enix have posted a 4.8% year on year decline in revenue, from ¥188bn to ¥179bn. Operating income for the same period has fallen by 65.3%, from ¥33.7bn to ¥11.7bn. The fall can almost exclusively be attributed to the fall in revenue from Digital Entertainment (Video Games). Net sales rose compared to the same period of the prior fiscal year thanks to the launch of console titles including “SHADOW OF THE TOMB RAIDER,” “JUST CAUSE 4,” and “OCTOPATH TRAVELER.” Meanwhile, operating income declined year-on-year due to greater amortization of development costs for major new titles and increased advertising expenses. urther afield there are plans in place to release the remasters of Final Fantasy X/X-2 and Final Fantasy XII: The Zodiac Age during Q1 next year. The remainder of 2019 will see the release of Final Fantasy VII and IX on the Nintendo Switch and Xbox One. Romancing SaGa 3, Batallion 1944 and Babylon’s Fall are also all planned for a 2019 release. Other areas of games haven’t fared as well, nor are they likely to in the near future. MMO’s and Mobile/Browser games have both noted a fall from last years revenue figures. MMO has remained relatively consistent over the current three quarters in income, though showing a loss from last year. Mobile/Browser, on the other hand, is now in its 5th consecutive quarterly drop in operating income. MMO’s are expected to remain stable – though having lower disk sales as a result of no recent expansions. It’s expected that players will remain with the games thanks to constant updates to the current games. The Shadowbringers expansion for Final Fantasy XIV is scheduled to be released in Q2 2019-20, which should help increase revenue and income for at least that quarter. Mobile, on the other hand, is having troubles – though expected to improve during Q4. Profits have been lowered as a result of expenses, but new titles are performing below expectations. As a result of the area’s performance, the company is now focusing on rebuilding the development methods of titles and utilising their more successful IP’s in hopes of leveraging them for future success. In the smart devices and PC browser area, many of the titles newly launched in the prior fiscal year performed below expectations and failed to generate additional revenue on top of that from existing established games. A decrease in licensing income and an increase in advertising expenses also resulted in a year-on-year decline in net sales and operating income. 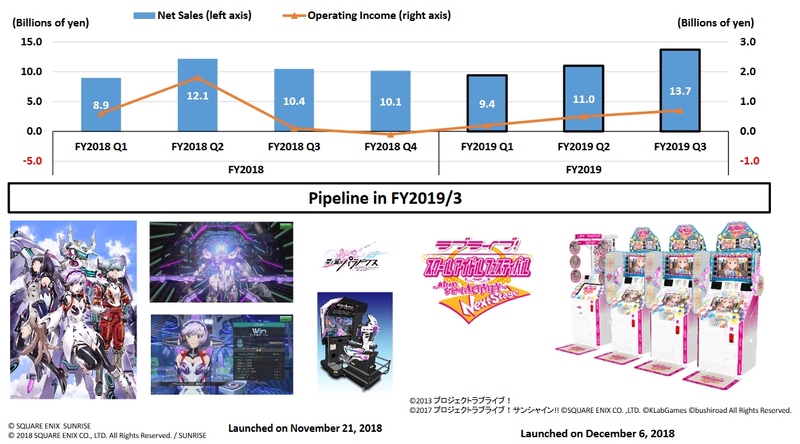 “Romancing SaGa Re; univerSe,” which was launched in December 2018, made a good start (net sales from this title are not recognized in Q3 but will be booked in Q4). As with other Japanese companies we have recently covered, such as Konami (TYO:9766), Capcom (TYO:9697) and SEGA (TYO:6460), Square Enix also has a division within Amusements, which are arcade or Pachinko machines. In the case of Square, it’s the running of amusement facilities and the sale of machines. The area has been showing a decent amount of improvement, particularly the fact that this is now the fourth consecutive quarter that operating income has grown and the third for revenue. Net sales rose compared to the same period of the prior fiscal year thanks to the release of new amusement machines and solid amusement facility operations. On the other hand, operating income declined year-on-year due to greater amortization charges associated with renewal of game machines installed in arcades and to lowering of profitability from amusement machine operations. The two remaining areas for the company are publication and merchandising. Both are relatively small, bringing in ¥9.9bn and ¥5.1 in revenue, with ¥2.8 and ¥0.5 in operating income respectively. The publication division is actually noting a YoY growth in both revenues and income while merchandising is showing a decline. Publication has shown an increase in sales as a result of new Manga, but also the MANGA UP! application, which has shown improved sales of manga on the app. Merchandising, however, is in decline. However, this will – as with games – likely show a turnaround during the fourth quarter thanks to the success of Kingdom Hearts 3. Kingdom Hearts has, in the past, always been a strong title for merchandising opportunities. As stated in the piece, Square Enix is likely looking towards a much improved fourth quarter to end the year on a relative high. Much of this will be on the success of Kingdom Hearts 3, a long-anticipated title that – as mentioned – is already a success with five million copies sold. The uptick in amusements, as well as the investment in refurbished machines and arcades, is also likely to see an improvement over the coming quarter and year. Expanding on this is the list of titles that are planned to be released over the current calendar year. All in all, the future for Square Enix is looking considerably better, following what has been a slow year for the company.